serious offshore voyages, yet is equally at home as a very comfortable local cruiser. Bermudan cutter rigged with aluminium keel stepped Forespar mast and boom. Harken headsail furling systems on both jib & staysail. Yanmar 4JH2E 51 hp 4 cylinder fresh water cooled naturally aspirated diesel engine. servicing, Racor fuel filter with water separator mounted on easy access panel. Sleipner SP95T bowthruster with joystick control at helm. dedicated engine start battery with momentary parallel switch at engine control to house bank for emergency booster starting. electric Mastervolt panel installed with battery charge control, circuit breakers & indicator lights. Two double cabins with possibility to sleep three in saloon. excellent through ventilation and natural light. centre-line island berth with slatted base under the mattress, large stowage and hanging lockers, extra lockers on each side, aft end of bunk lifts on gas assisted struts to reveal large blanket tray. Two opening ports and overhead deckhatch for good cross-flow ventilation. Forward Heads: large forward heads compartment with access doors from forward cabin and saloon. teak trim, large vanity unit with linen cabinet, storage cabinets, manual sea toilet (direct overboard discharge or bypass valve into holding tank) with fold down teak shower seat, polished S/S basin with hot/cold pressure water supply and shower, fold away acrylic shower doors enclose a separate shower area, electric shower drain pump. Main Saloon: main salon with pull-out double settee berth to port, and single settee berth to starboard, teak cabinets and book shelves on each side, extra hanging/stowage locker at forward end of starboard berth. deluxe drop leaf table with light over folds against bulkhead rack with bottle storage, ample handrails for safe moving while under sail. keyboard & mouse. Chart stowage drawer beneath settee. Galley Area: large galley, top loading refrigerator with freezing element and electric drain pump, inside light with manual switch, hinged gasketed lid with gas support strut. 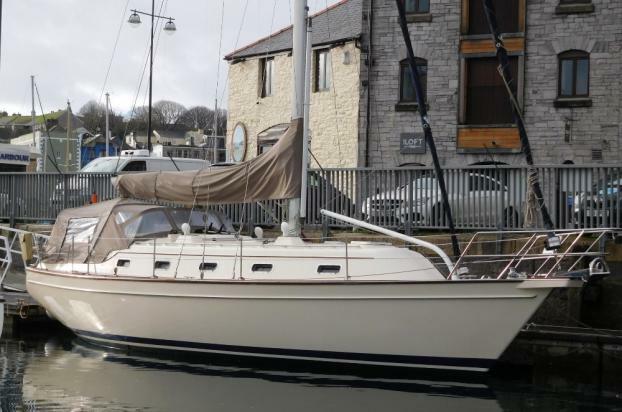 Aft Cabin: Roomy aft cabin with a large "athwart-ship" double berth with stowage lockers under, slide out vanity basin with hot and cold pressurised water supply, generous hanging locker with shelf over. Two opening ports and overhead deckhatch for good cross-flow ventilation. - Port side cockpit near to wheel: Raymarine St6002 Autopilot, Raytheon Masterview multi display, Autohelm Navigator keypad. display, Raytheon St80 wind speed & direction display, Raytheon Remote keypad. - At Chart Table: Raytheon Autopilot Remote control. ShuttleX PC with keyboard inset into chart table. high modulus fibreglass construction throughout with special gel coats for durability.